From the Great Falls thundering into the city of Paterson, the Passaic River continues north, reversing itself at Hawthorne where it flows about 25 miles to Newark Bay. At the Paterson/Hawthorne/Fairlawn point -- it becomes the boundary between Passaic and Bergen Counties and between Essex and Hudson Counties. Flowing downstream from Hawthorne, the river has been dammed at Garfield & Clifton, creating Dundee Lake. Below the dam at Garfield, the Saddle River joins the Passaic and flows through heavily industrialized and residential areas of Bergen, Hudson and Essex Counties. Dundee Dam was built to create the Dundee Canal, which travels through Clifton, Passaic, and Paterson. Hundreds of jobs could be swept away, along with a key backup to New Jersey's drought-stricken water supplies, if a plan to lower the lake behind Dundee Dam goes through, critics say. Citing safety concerns over the 143-year-old Passaic River dam, federal officials have ordered the water behind it taken down by 2½ feet this summer. Eventually, they want the stone dam to be permanently lowered. Dundee Lake, the pool behind the 20-foot tall dam, is a water source for both Marcal Paper Mills Inc. and Garden State Paper. The mills say lowering it would cost them dearly - especially Garden State, which is struggling to reopen its Garfield plant after the bankruptcy of its infamous owner, Enron. Environmentalists, meanwhile, say Dundee Lake could be an emergency water source this year if drought problems continue. Shrinking it makes even less sense during the state's worst water crisis in decades, they warn. "It amazes me that no one is saying, 'Hey, we have a drought condition. What happens during this summer?" said Nick Marcalus, whose family-owned paper-products giant employs 1,000 people in Elmwood Park, upstream from the dam. "This is going to happen, and after it happens, I think a lot of people are going to be sorry that they didn't have more understanding of what the impact is." Federal and state agencies consider the aging dam a "high hazard" that needs to be fixed soon. A 1997 federal report questioned the dam's "stability" and noted that a spillway meant to release excess water was undersized, raising the risk of flooding on Route 21 or in surrounding communities. A 2001 follow-up inspection found the problems remained, according to the state Department of Environmental Protection. United Water, the Bergen County water supplier that co-owns the dam, says there's no immediate danger of the dam collapsing. But a letter last week from the Federal Energy Regulatory Commission, the agency that ordered the lowering, warned that the structure was "inadequate" even under normal conditions. The order to fix the dam comes as state officials have complained about leaks, broken pumps, and other problems throughout the state's water supply infrastructure as New Jersey battles its worst water crisis in decades. While Dundee Lake probably wouldn't be used for drinking water, in a pinch it could supply industries or firefighters, some say. The state's Water Supply Advisory Council - a panel of environmentalists, water suppliers, and other experts -added its concerns on Friday, urging that the lowering be delayed until after the current drought. Marcal, meanwhile, says it would need to spend $400,000 to $700,000 to reconfigure a pipeline that dips into the river, if the lake is lowered. Garden State Paper says it's in more dire straits. The company closed last fall after Enron's collapse, taking 250 jobs with it. Lowering the dam would destroy its water supply and hamstring any hopes of reopening, city officials say. "We're just trying to do everything in our power to get Garden State Paper up and running again," Mayor Frank Calandriello said. "Lowering Dundee Dam couldn't come at a worse time." The federal energy commission had ordered the drawdown to begin by April 23. But Enron has sought a delay in bankruptcy court, arguing that the project could jeopardize the possible sale of Garden State to an as-yet-unnamed buyer. As a result, the deadline was extended by a month. But it will be the last delay, the energy agency warned in a memo last week. It regulates Dundee Dam because the dam once generated electricity. United Water, which proposed the lowering and manages the dam, says it's seeking a solution that harms no one. But the federal orders leave it little choice, spokesman Kevin Doell said. "We understand the issues with regard to the economics of Marcal," Doell said last week. "Naturally, those issues of cost also apply to both water companies and their customers in terms of looking for a responsible way for taking care of the problem." The utility owns the dam with its fellow water supplier, the North Jersey District Water Supply Commission. United Water initially hoped to finish lowering the water by Sept. 30. The dam itself would be lowered 2½ feet sometime after that. Older than Garfield itself, the Dundee Dam curves 450 feet across the Passaic to the far shore in Clifton, near a historic spot where British forces forded the river in pursuit of retreating Colonial troops in 1776. When New Jersey Gov. William Newell laid the dam's cornerstone in 1859, observers called it one of the state's manmade wonders. The project had an inauspicious beginning, nonetheless. The nearby Dundee Canal, dug to improve navigation on the river, saw all of one ship before its owners declared bankruptcy two years later. Eventually, though, the dam attracted industries that drew power from water rushing through the canal. Now, however, both federal and state regulators call the dam a safety hazard. To get the 30-day extension from FERC, the utilities proposed several interim measures, including biweekly inspections, continuous electronic monitoring of water levels, and more coordination with the National Weather Service to anticipate flooding. On Tuesday, United Water employees will gather in a conference room for a "table-top" drill that simulates everything from leaks in the dam to a terrorist plane attack. But Doell, United Water's spokesman, insisted the dam is safe. "The dam's quite strong, but it's just not in accord with federal standards," he said. Marcalus, the Marcal president, agreed the dam may have to be lowered permanently - just not now, during a drought. Normally, Dundee Dam holds back an additional 14 feet of Passaic River water. But this year's drought has lowered levels on both sides of the dam already. Siphoning off another 2½ feet makes it more likely Marcal won't be able to pump all the water it needs, he said. And while safety concerns may exist, they're not the sole reason for shaving off part of the dam, Marcalus added. That is simply the cheapest option for the utilities, if not necessarily for the paper mills, he said. Company attorney Charles V. Bonin said Marcal was being forced to pay for the dam owners' "fiscal mismanagement." But Doell said lowering the dam was the only responsible move. Repairing it at the same height would cost twice as much, he said, declining to give exact figures. Along with the economic worries, the Passaic River Coalition, an environmental group, has raised other concerns. Shrinking the lake could dry up habitat along the shores that supports wildlife, said the group's leader, Ella Filippone. A spokeswoman for the energy commission said the agency has not approved permanent changes to the dam yet, just the temporary drawdown. Because the decision is still pending, the agency won't comment on the controversy, Celeste Miller said. The final ruling will require a detailed study of environmental impacts, she said. State environmental officials say they're concerned about the potential impacts as well and are studying the issue. But New Jersey has not taken a position on Dundee Dam, said a DEP spokeswoman. That's little satisfaction to Marcalus, who says state, local, and federal officials have been "remiss" in letting the project go forward. "We are hoping that cooler heads prevail and that we don't have to resort to legal resources," he said. "But I think we have a situation that's out of control." 150-year-old Dundee Dam, jointly owned by United Water and the North Jersey District Water Supply Commission, will be upgraded within the next year. The Passaic RIver dam's face will be restructured, and the dam will be anchored to underlying bedrock with 40' steel rods. The dam's owners are seeking grants to pay for the work. "This federal designation and study agreement mark a new beginning in our efforts to revitalize the historic cities and towns that lie along the lower Passaic River's edge. A cleaned-up Passaic River will bring new business to these communities, giving the region's economy a shot in the arm and improving residents' quality of life," Rothman said. "That said, as this historic initiative moves forward, the EPA and Army Corps must ensure that the parties who discharged literally tons of deadly toxins and industrial contaminants into the river are held accountable for their actions and are made to pay the costs of the river's cleanup." The new program on the Passaic, termed the Passaic River Restoration Initiative (PRRI), is aimed at finding and implementing comprehensive solutions to the complex contamination problems facing 17 miles of the lower Passaic River between Newark Bay and the Dundee Dam in Garfield. A study of the best way to clean the Passaic River will be first conducted, followed by the actual restoration. "As a member of the House Appropriations Committee, I look forward to doing my part in the months and years ahead to ensure that the resources of the federal government are brought to bear on the effort to clean up the Passaic River and the efforts to hold the polluters responsible," Rothman said. "By bringing in these federal agencies and federal money to clean the Passaic River, we are not only cleaning up our environment and making our communities more attractive to new residents and businesses, we are sparing local property taxpayers from the cost of this study and cleanup." The PRRI will be managed jointly by the U.S. Army Corps of Engineers, Environmental Protection Agency, and New Jersey Office of Maritime Resources, working in conjunction with the Department of the Interior, National Oceanic and Atmospheric Administration, and New Jersey Department of Environmental Protection. The Lower Passaic River is a 17-mile tidal stretch from the Dundee Dam to the river mouth at Newark Bay. The river has a long history of industrialization, which has resulted in degraded water quality, sediment contamination, loss of wetlands, and abandoned or underutilized properties along the shore. The goal of the Lower Passaic River Restoration Project is to develop a plan to improve water quality, remediate the sediments and restore the ecological health of the Lower Passaic River. The U.S. Environmental Protection Agency, U.S. Army Corps of Engineers, New Jersey Department of Transportation, and New Jersey Department of Environmental Protection have formed a partnership to carry out the project. The agencies are bringing together the authorities of the Superfund program, the Water Resources Development Act, the Clean Water Act, and other laws to identify opportunities to improve the health of the river. Dundee Dam, which spans the Passaic River between the city and Clifton, was built in 1854, but it has never had major repairs or renovations, leading residents and officials to question its stability. "God forbid something should happen to the dam," said City Manager Thomas Duch. "If there was a breach in the dam, it could flood out the 1st Ward of the city of Garfield." Duch said there have never been problems with Dundee Dam - it has weathered, among other things, multiple floods and Tropical Storm Floyd. By next April, the dam is set for upgrades that will bring it into compliance with state and federal requirements. "Standards are more stringent than when it was built 150 years ago, when there were no standards," said Emad Sidhom, a senior project engineer at United Water, a private company that owns half the dam. The North Jersey District Water Supply Commission, a state agency, owns the other half, he said. Among other upgrades, the dam's face will be restructured. Forty-foot steel rods will be bored into the bedrock below, anchoring the structure in place. "We're practically tightening the dam onto the rock," Sidhom said. "We know it's a damn good dam." Sidhom said that none of the work will require lowering the water or the dam. It will take seven to eight months to finish, and Sidhom estimated the cost at about $3 million - which would come from grants being sought. (Washington, D.C.)-- The Passaic River in New Jersey was named today one of the twenty most endangered rivers in the country by American Rivers, the nation's leading river conservation group. Dioxin has been found in the river's sediments which are being carried by tides to other parts of the waterway and increasing the risk to aquatic life and human health. The Passaic River is one of 96 watersheds across the country threatened by high levels of contaminated sediments, according to the Environmental Protection Agency. In a report, The Incidence and Severity of Sediment Contamination in Surface Waters of the United States, released in January of this year, the EPA reports that 10 percent of all sediments in US rivers, lakes, and bays are contaminated with toxic pollutants. The Diamond Alkali Company owned and operated a pesticide manufacturing plant on the banks of the Passaic in Newark from 1951 to 1969. In 1984, the facility and the adjoining six-mile reach of the river was listed as a Superfund site. The Environmental Protection Agency has been slow to take action to clean up the site, however, and the dioxin-contaminated sediments are spreading throughout the river. "Because the EPA has been slow to act, the river is suffering greater harm as dioxin contamination spreads," stated Margaret Bowman, director of hydropower programs for American Rivers. "EPA must restore this river. The severity of the threat to wildlife and people demands that the river be dredged and the sediments be disposed of immediately." Dioxin has been found in sediments in the Port of New York/New Jersey and has already had an economic impact on the port: the cost of disposing of dredge material has increased tenfold. According to the EPA, dioxin and related chemicals cause a range of negative health effects, including reproductive and immune system disorders, impairment of fetal development, and cancer. Approximately 40,000 people live within one mile of the Diamond Alkali site; 37,000 live within three miles. The Passaic flows through one of the most densely populated urban regions in the United States. While much of the upper Passaic has been revitalized, the lower river remains typical of a neglected urban waterway. 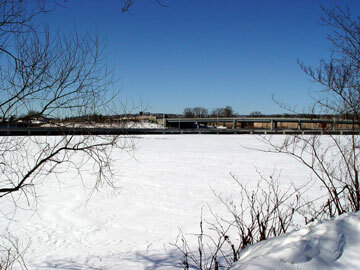 The Passaic's waterfronts are entirely developed and public access to the river is limited. The announcement on the Passaic River came as part of the release of the American Rivers' 13th annual report, "America's Most Endangered Rivers of 1998." The report examines rivers which this year are facing the most serious and immediate environmental abuse and provides an overview of the state of rivers today. and toxic waste from mining operations in pristine rivers and streams. "We continue to abuse our rivers -- by damming, draining, straightening, and polluting them -- all the while weakening their ability to sustain fish and wildlife. Freshwater species are disappearing at alarming rates -- three to seven times faster than any other species," said Rebecca Wodder, president of American Rivers. "These creatures are the miner's canaries -- warning us that our rivers are in trouble. Protecting our freshwater resources must be a national priority." The Hanford Reach of the Columbia River was named this year's most endangered river in America. The last free-flowing, undeveloped stretch of the Columbia in the U.S., the Hanford Reach is facing imminent threats from proposed development of the lands along the river. The Missouri River, severely altered by dams and channelization that support an infinitesimal amount of barge traffic, is the second most endangered river this year. Polluted runoff from chicken farms placed the Pocomoke River in Delaware, Maryland, and Virginia on the list as the third most endangered river in the country. The purpose of the report is to call attention to the myriad threats facing rivers in order to mobilize community action around protecting and restoring locally and nationally significant waterways.